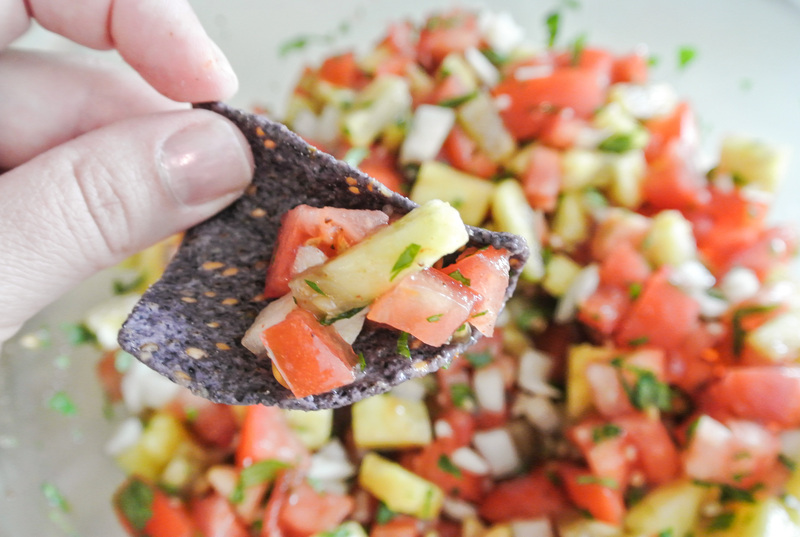 Salsa is an excellent way to eat a mix of great-for-you raw fruits and vegetables. With the combinations being endless, it’s no wonder that so many people love to dip in in front of the TV or at a party or restaurant. Salsa should be one of those snacks that you don’t feel guilty about. However, if you buy it premade, there’s a chance that it will be loaded with salt. My salsa formula is so simply flavorful that I don’t add any salt at all…not even a pinch. Why? Chances are, you are eating your salsa with tortilla chips. Most chips are salted to some degree, some more heavily than others. Because consuming minimal salt is a major premise of my plant-based lifestyle, my palate has become very sensitive to foods that are overly salty. Thus, the salt from the chips is enough for me in boosting the flavor of my already delicious salsa. I really like these chips, from Target’s organic product line. 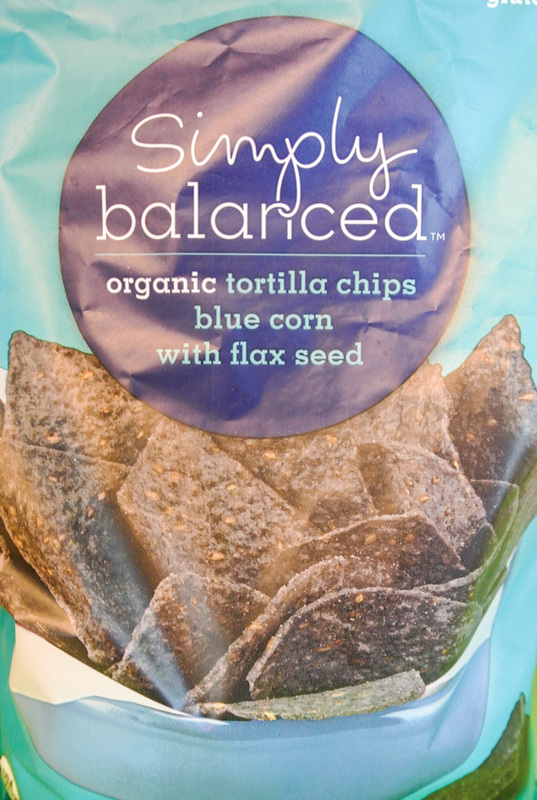 The ingredients are listed as follows: Organic blue corn, organic sunflower oil, organic flax seed, sea salt, lime. (NOTE: If you didn’t already know this, when reading a food’s ingredients on a nutrition label, they are written from greatest to least presence in the product.) True to its name, Simply Balanced, I haven’t found a better premade chip. They are heartier than your average tortilla chip and not too salty, which is perfect for me. CILNATRO: This common salsa staple is high in antioxidants and prevents oxidation, allowing foods that it is mixed with to stay fresh longer. GARLIC: There’s a reason that you can buy garlic supplements in the vitamin aisle. 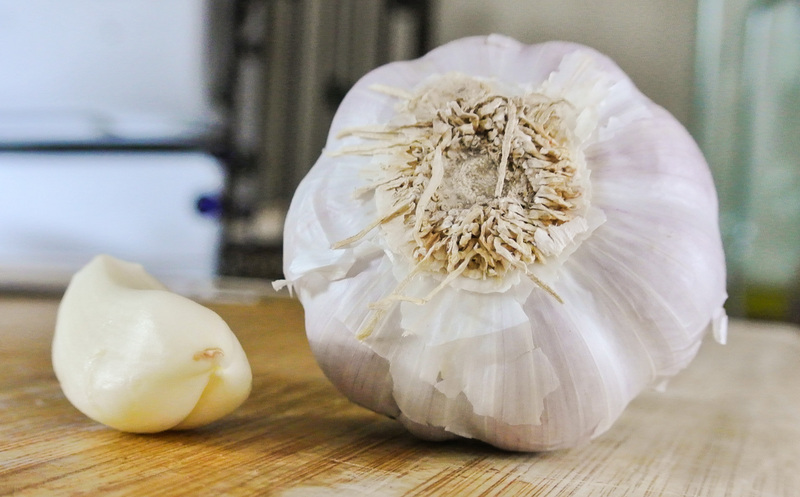 Raw garlic, in particular, has anti-inflammatory effects and can lower cholesterol. Those of you who have read up on my health history know how important this is to me! PINEAPPLE: Pineapple is nutrient-dense rather than energy-dense, meaning that it contains an abundance of nutrients for very few calories (I don’t count, but this may be important to you if you’re trying to lose weight). In one cup of pineapple, for instance, you can consume 40% of the recommended daily Vitamin C intake. Lay the pineapple on its side. Slice off the very bottom and the very top so that you are left with a cylinder that can easily stand flat on the cutting board in its upright position. While standing upright, take your knife around the perimeter of the pineapple and slice the skin off, top to bottom. You’re essentially cutting it off in vertical strips until you’ve made it all the way around. Once the pineapple is peeled, remove the flesh surrounding the core. 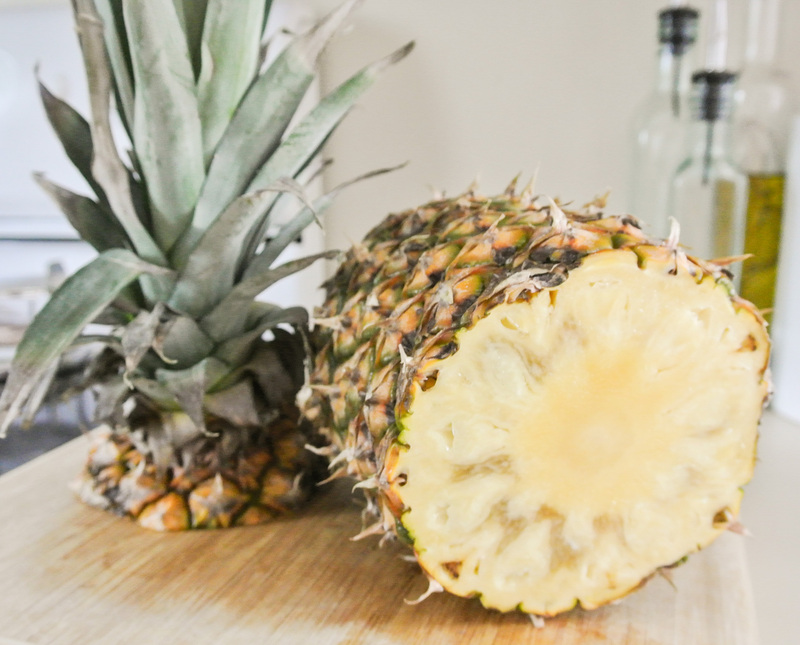 While the pineapple is standing upright, put your knife close to the edge of the core and slice downward, effectively removing nearly half of the pineapple. Repeat this process all around the core until you’ve done it a total of four times (the pieces will be uneven in size). Your core should appear as a long, thin rectangle when all of the flesh is removed. Chop your pineapple according to its projected usage and discard the core. If you happen to own a powerful juicer, you can juice it instead. 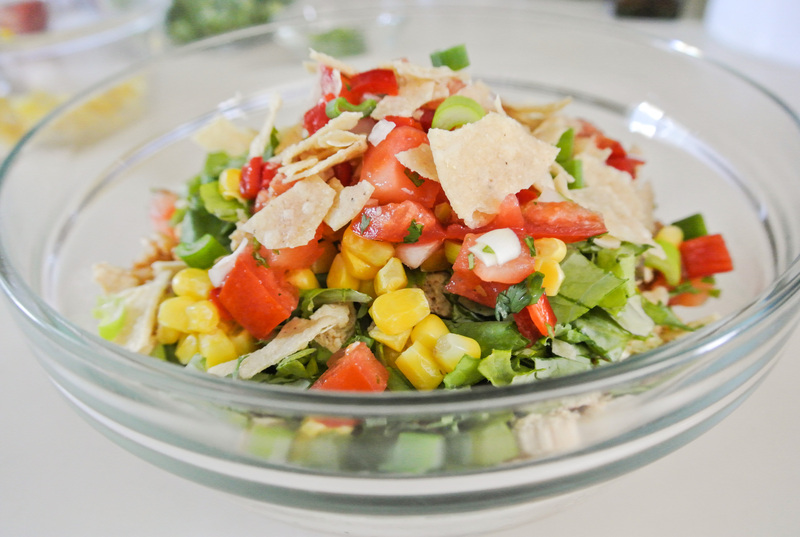 Serve as an appetizer or snack, or use it in a dish like my layered burrito bowl. Enjoy! 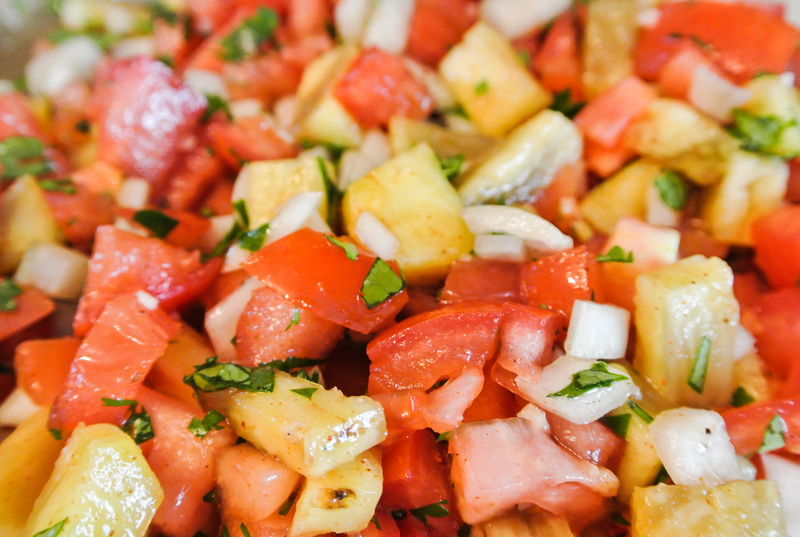 4 cups diced raw fruit and/or vegetables –> I’m using 2 ½ cups vine ripe tomatoes and 1 ½ cups pineapple. ½ of a medium onion –> I’m using yellow. 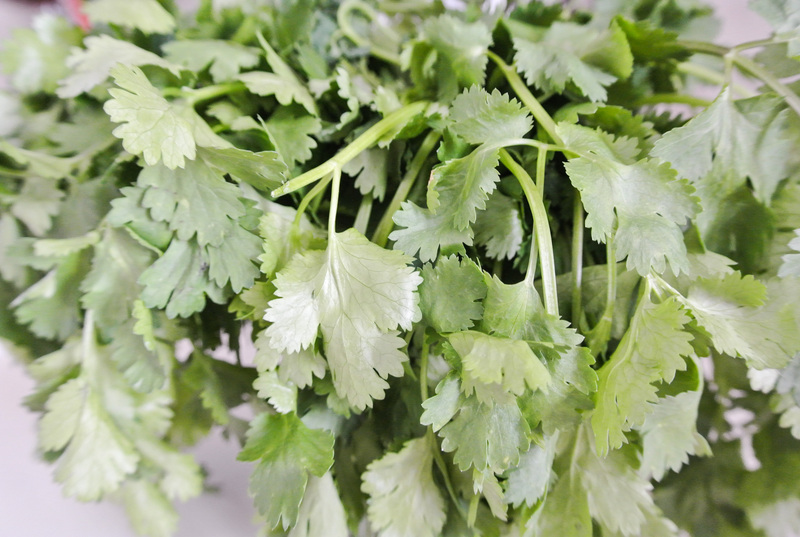 ½ cup finely chopped fresh herbs –> I’m using cilantro. 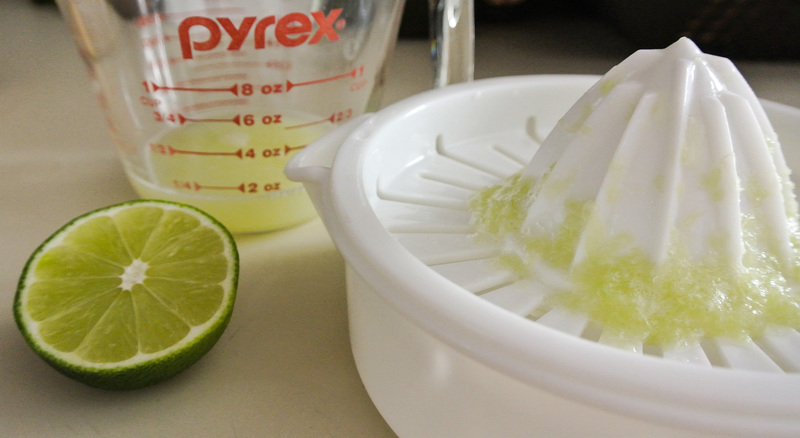 ¼ cup acid (vinegar or citrus juice*) –> I’m using the juice of two small limes. Seasoning to taste –> I’m using a dusting of chili powder, paprika, and cumin. Chop your onion and garlic and get them soaking in your acid, just as you did in preparing my bean salad formula. The acidity will help to break them down so that their flavors are less abrasive and don’t monopolize the salsa. Dice/chop all remaining ingredients, season, and stir. 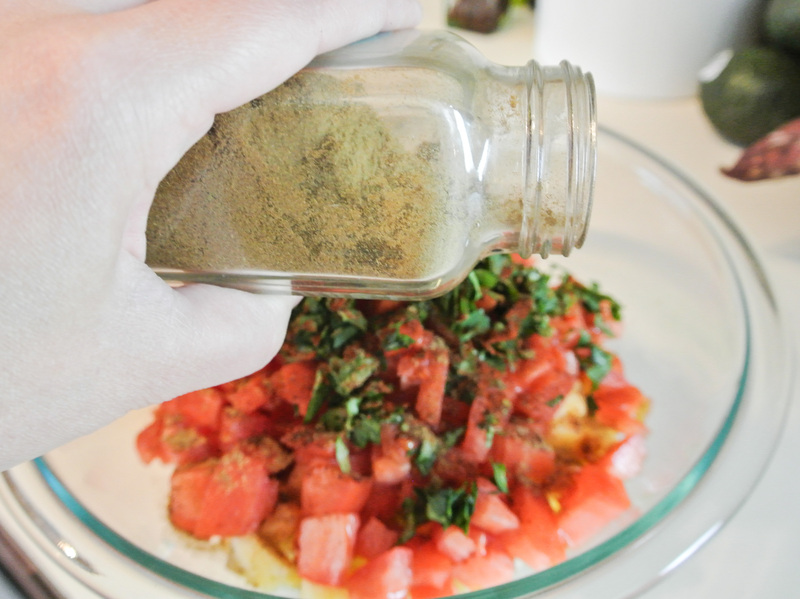 When it comes to salsa, I don’t typically measure seasonings. Once I have all of my produce in the bowl, I lightly sprinkle it with each of my preferred seasonings (if any) from one end of the bowl to another and that seems to work out nicely. Serve immediately or store in the fridge for a few days. As evidenced in my post about my daily eating habits, a plant-based lifestyle can be easily well-rounded, providing all of the nutrients that the body needs, sans cholesterol, hormones, excess fat, and other animal by-products. Over the last three years, I’ve found ways—including my Fresh Formulas, of course—to obtain a ton of nutrients accompanied by a ton of flavor, all while feeling satisfied and not having to count calories. The more I think I about this, the burrito bowl concept just might be the perfect vegan meal. In one bowl, you can combine whole grains, protein, and fresh fruits and vegetables. You’re guaranteed full and satisfied without the guilt that comes with meat, cheese, and sour cream. I’m not a big fan of fast food, but if I’m going to indulge, I love the fast-casual establishment Chipotle. Even though I don’t eat it, I even appreciate the company’s stance on meat! Chipotle just knows how to do it right, and when I think of a burrito bowl, their buffet-style setup is the first thing that comes to mind. Chipotle—and burrito bowl—fans, you’re definitely going to want to keep reading! Corn is an easy veggie to have on hand in the freezer. 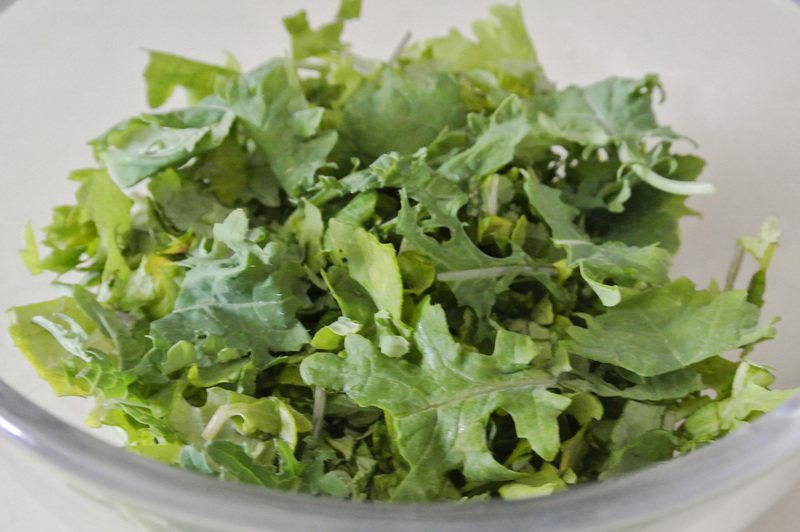 I don’t use a lot of it because other fruits and vegetables certainly pack more nutrients, but I love the texture and flavor, especially in a dish like this. Next, we have green onions, which I’ll be using as a garnish. Then, you see a salsa I quickly threw together with yellow onion, roma tomatoes, sweet red peppers, cilantro*, and fresh-squeezed lemon juice (I’m all out of lime). Making salsa can be easy, ya’ll; stay away from the jarred stuff that’s packed with sodium. *There is cilantro growing in my front yard! In my post about starting your own garden, I promised you that if you took care of the birds and the bees that they would do their job in pollinating and spreading seeds. Between our backyard critters and the wind, we now have a randomly delicious cilantro plant driveway-adjacent. Very cool. Switching gears, you’ll notice that this formula contains very little salt. I combat what might be perceived as a lack of flavor by really ramping up the spices. I cook my whole grains and tofu (when I use it) in a variation of the spice blend I use in my chili formula. The entire formula—which serves 4-6 people—contains less than ½ tsp of salt. Impressive, huh? You don’t even need to use any at all if you don’t want! Finally, more about the tofu. Check out my post on vegan yogurt for a more detailed explanation of tofu and why some people love it and some hate it. 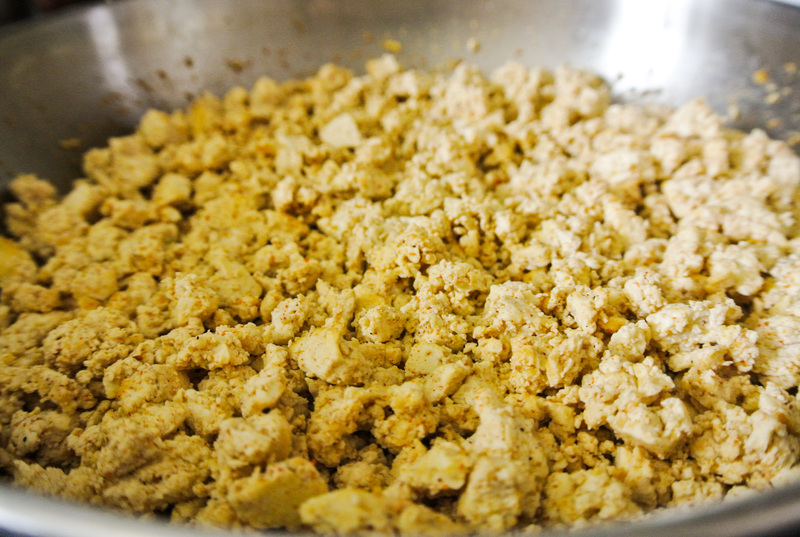 For today’s purposes, just know that a little bit of tofu won’t hurt you and when sautéed in crumbles on the stove, a mock “ground chicken” is born, if you’re having a tough time kicking meat. I swear it’s good! On top of that, the tofu I use is organic and non-GMO. Wins across the board (until I learn to make it myself)! It’s time for a burrito adaptation that you won’t regret eating and that combines the necessities of a healthy diet. Enjoy! 2 cups whole grains (e.g. brown rice, farro, wheat berries, quinoa, etc.) –> I’m using brown rice. 2 cups protein (e.g. beans, lentils tofu, tempeh, etc.) –> I’m using black beans and crumbled tofu. 1 cup “crunch” (e.g. tortilla chips, nuts, seeds, etc.) –> I’m using broken tortilla chips. ½ cup garnish (e.g. fresh herbs, green onions, etc.) –> I’m using thinly-sliced green onion. **Guacamole would be delicious as well. I just don’t happen to have any avocados on hand. Either way, DIY to avoid excess salt and other preservatives. 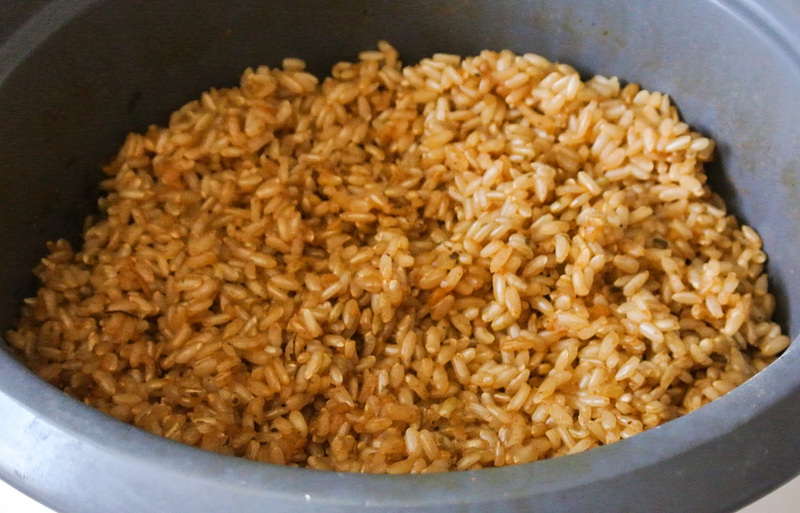 First, get your grains cooking in homemade veggie stock or water. Add all of your seasonings directly to the cooking liquid so that the grains absorb the flavor as they cook. Next, prepare your protein. If you’re using canned beans, they are already cooked and simply need to be drained and rinsed. If you’re using dried beans, soak them in water overnight and then boil on the stovetop while your grains cook, until tender. Tofu and tempeh are also precooked, but I like to doctor up the tofu so that it more so resembles the texture of ground meat. 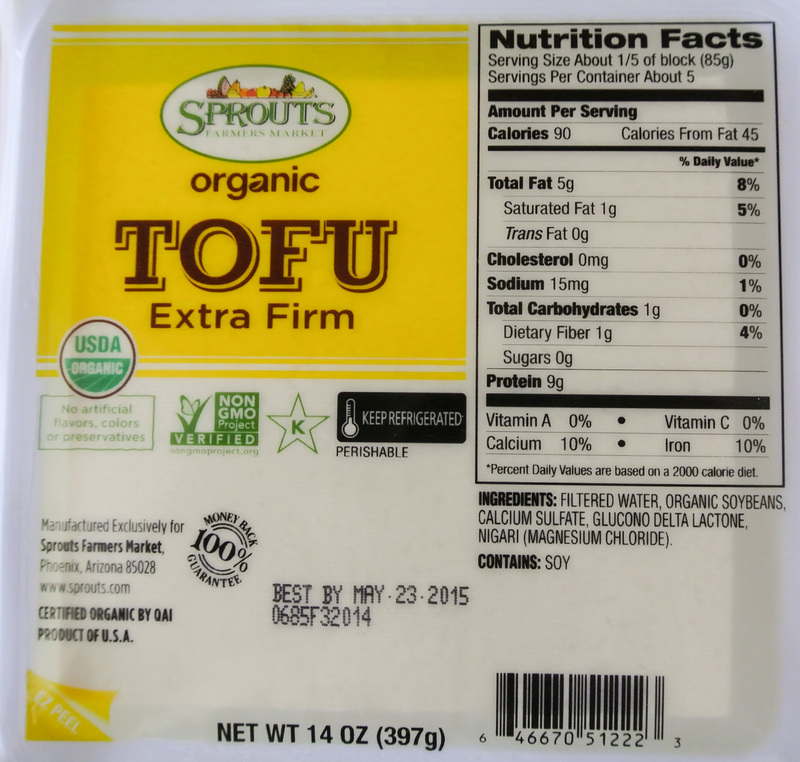 After opening a package of tofu, drain the water and wrap the block in a clean towel to absorb even more water. Then, crumble into a medium-hot pan and season. I am using the same spice combination that I am using for the rice, just in a lesser amount. No measurements needed; just give the tofu a healthy sprinkle of the spices you like and stir so that it is evenly seasoned. After about 5 minutes, turn the heat down to medium low and stir occasionally. The tofu crumbles will reduce in size as they lose moisture, giving them a more meat-like consistency (if that’s what you’re going for). Then, eat! I would store leftover components separately in the fridge…although I doubt there will be any. J This formula would be easy to make in large quantities and set up buffet-style for a family dinner or party. Dip, Salsa, or Square Meal? To answer your question, this dish, based off of my bean salad formula, is all three: dip, salsa, and square meal. I’m housing it under my Square Meal Formulas because while it makes for a great snack, it can serve as a delicious, filling, and protein-packed lunch or dinner, too. 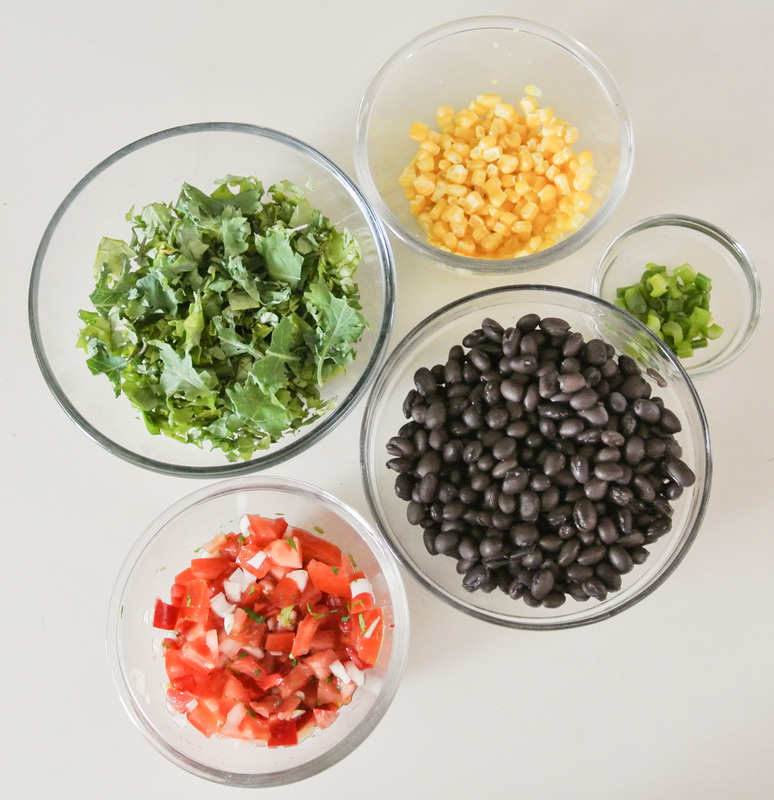 If you tuned in last week for my chili recipe and are not ready to leave the Southwest, you will love trying out my bean salad. 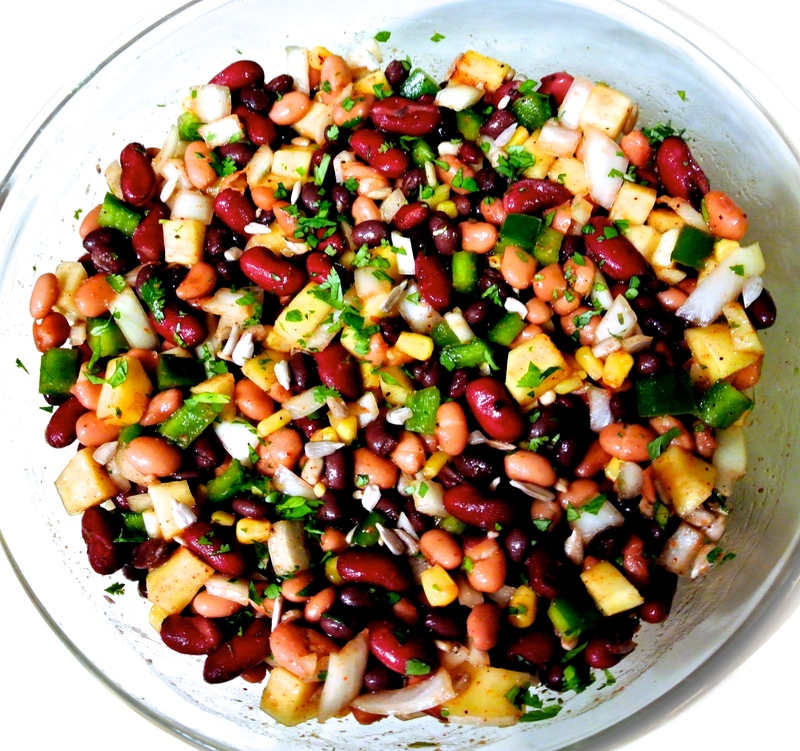 This recipe is a cross between my mom’s “Texas caviar” bean dip and my husband’s mango salsa. It is served cold and alone, with tortilla chips, or as an addition to a Latin or southwestern dish. While my recipes minimize added fat, sugar, and salt, I do sometimes add just a little to maximize flavors. Sesame oil lends itself perfectly to this philosophy, as it is extremely flavorful in quite small amounts. 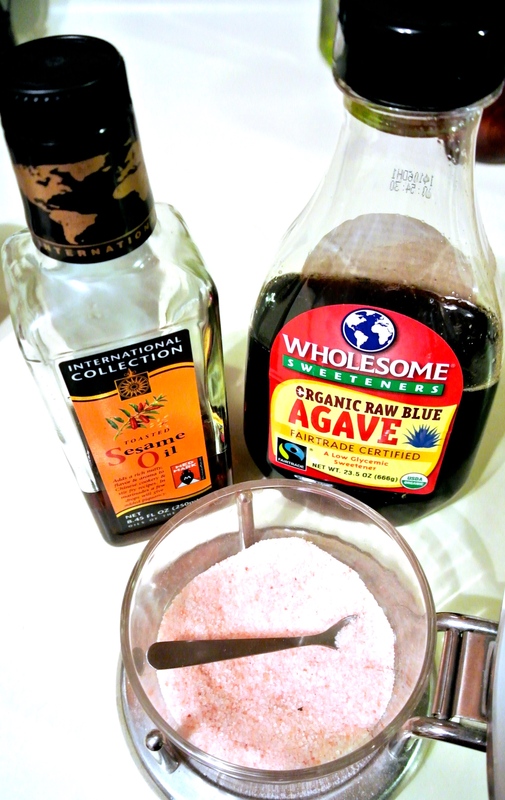 To keep your blood sugar levels at bay, organic agave syrup—a low glycemic sweetener—is a great alternative to white, granulated sugar, which I haven’t purchased in years. Finally, pink Himalayan sea salt is the super salt of the sodium world! This salt contains over 80 vitamins and minerals, is naturally high in iodine, has less sodium per serving than table salt, and has a myriad of other health benefits. If you’re adding salt, this is the way to go. 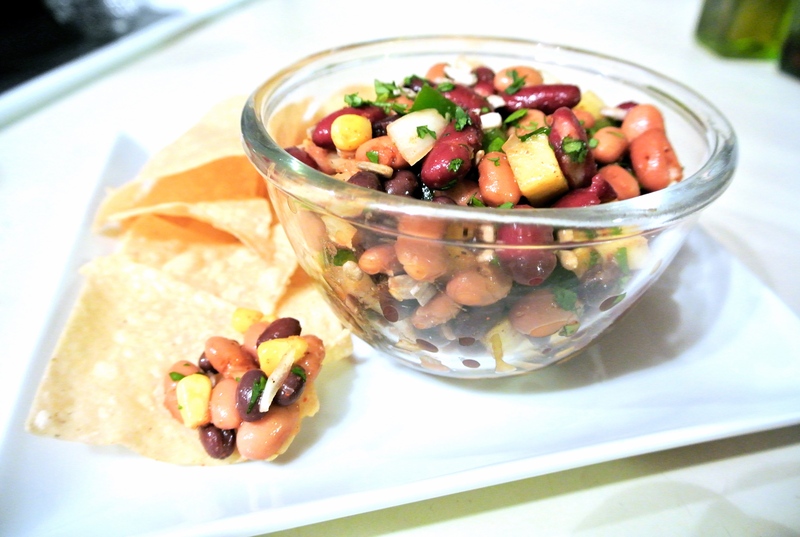 If you’re feeling extra adventurous, make your own tortilla chips to compliment this bean salad. Never having yet made them myself, I’ve purchased a few from a local Arizona Mexican restaurant so I can see how it’s done! 2 cups cooked beans, no added salt –> I’m using extra beans today, in an effort to mimic elements of my mother’s Texas caviar recipe. I’m incorporating equal parts kidney, pinto, and black beans (just like my chili recipe), totalling about 5 ½ cups. 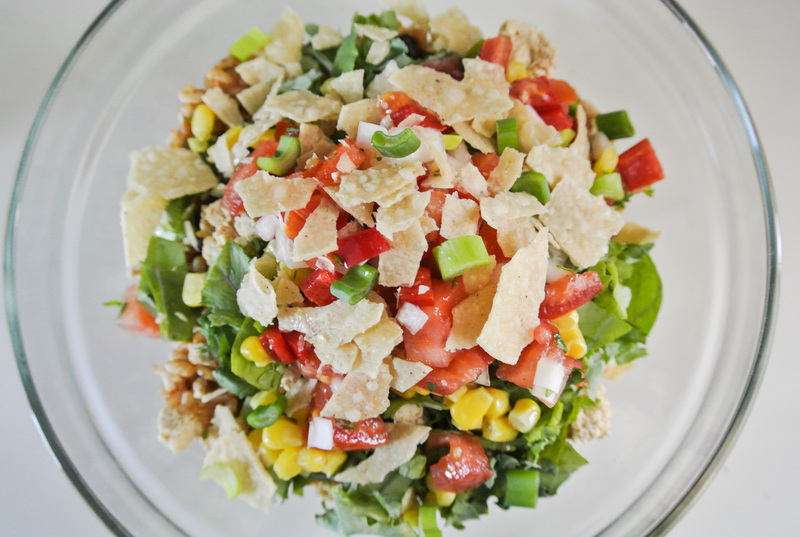 2 cups chopped raw fruits/veggies –> I’m using ½ of a small green bell pepper, ¼ cup frozen corn, 1 medium size mango, and ¼ cup fresh, finely chopped cilantro. 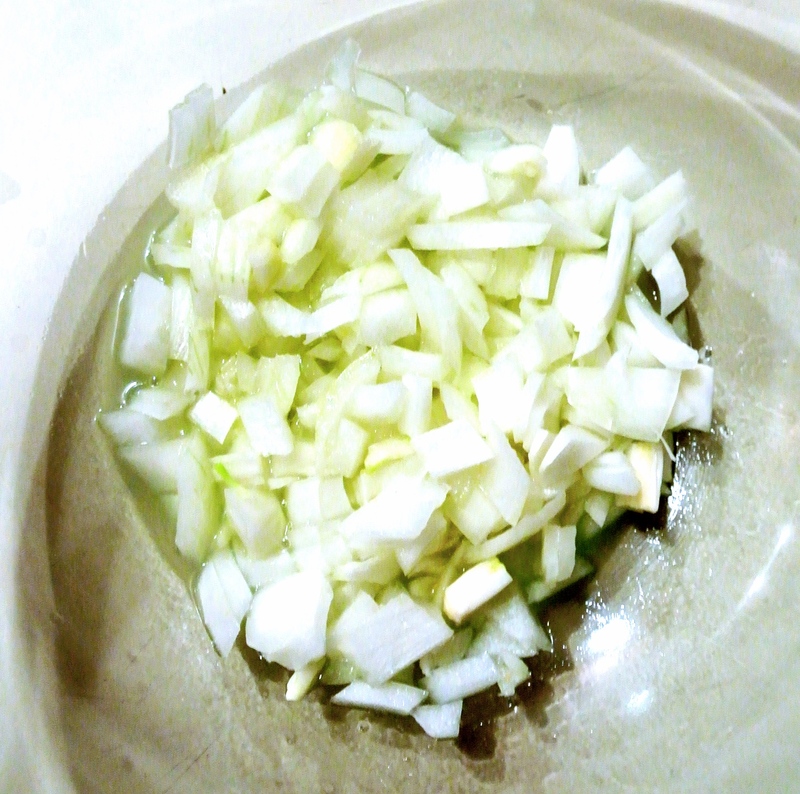 ¼ chopped raw onion –> I’m using yellow. ½ cup seeds and/or chopped raw nuts –> I’m using raw sunflower seeds, a little less than a ½ cup. Citrus juice (size matters…start small) –> I’m using the juice of two limes. Spices, herbs, salt, and pepper to taste –> I’m using ½ tsp each of chili powder, paprika, garlic powder, and pink Himalayan sea salt, and ¼ tsp cumin. Before anything else, chop your onion and get it soaking in the citrus juice. The citrus helps to break down the abrasive flavor of the onions. Next, drain and rinse your beans, allowing them to drip dry in your colander while chopping your fruits/veggies. Combine all ingredients and mix. Store in the fridge up to a week.